Please join us for the first ever Sandwich STEM Academy Art Show! 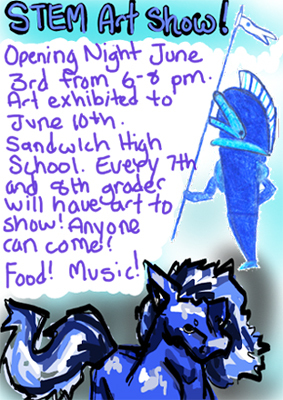 The student Art Gallery Team has planned an exciting opening night on June 3 that includes food, music,and hundreds of pieces of original art. Every 7th and 8th grader has been invited to include artwork in the show.Artwork will be on display throughout the A Wing of the Sandwich High School for one week following the opening night event. Students, families, teachers, and community members are all welcome. Help spread the word by posting a flyer around Sandwich!